If we are filling up the race seats, how about letting the race drivers run fp1 next season? Unfortunately we are forced to change plans for the last race. This would mean Mr. Steer will return to race for SMS in the final race. Mr. de Boer will stay in the tester #1 seat of the Dutch team, mostly known as team with no driver swaps whatsoever . > > idea of where available seats are. Wow, finally Seb Nell answered! About test drivers, do you contact GPGSL-3 drivers to find someone?? > Wow, finally Seb Nell answered! No. No word from Seb in a long time....He is effectively goneski. Firstly - Filling in for the final race of the season for Demon Racing in the race seat, we welcome Luke Russell, aka Lucasiano. Welcome aboard for a race debut, thrown straight into the fire at Emmelord - bring your brown undies! Edited 1 time(s). Last edit at 03/20/2018 11:46AM by shep34. > return to race for SMS in the final race. Obviously it's nice to be able to strap myself into a race seat, but it's disappointing to see Snake in a tough spot with drivers yet again. Considering how much time and effort you put into the series and the team, I can only hope you get someone good onboard Maikel! Hi, Rico!!! I think it's good for all!! Welcome again! Yeah mate, 2,5 to 3 years I think. Considering rejoining but... not enough people around anymore? Yep, banned by your majesty mortal. Please save us from this cruelty! > > are left over from S11 driver/team lineups. > That's awesome! Exactly the kind of thing we need. > Cheers Greg. Get PM'ing me guys. > AMR sensation Jack Elleker and Mr Connor "cannot"
> also had spells in the Christel garage I believe. > Yeah mate, 2,5 to 3 years I think. 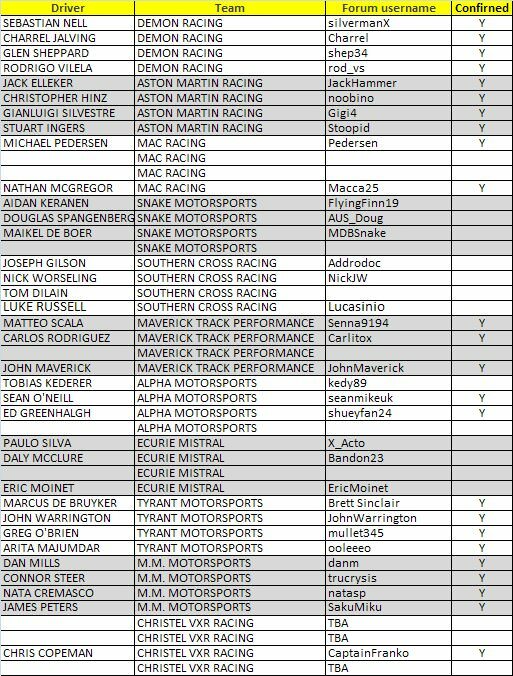 Does the Teams/drivers list of page 1 reflect the actual state of affairs? > actual state of affairs? Team owners! Interested in signing an exciting, young, suave, good looking, hot blooded Italian racing driver to your race team? Well, Gianluigi Silvestre is the man for you. He is available on loan from Aston Martin Racing. He would remain contracted to AMR and we would reserve the right to recall him to a race seat should the need arise.